My Youngest Client and Her Vintage Furniture – Uniquely Yours… or Mine! This dresser was FAR from perfect, it was extremely dirty, it looked like someone had started a refinishing process on the top and had just given up and some of the drawers were in need of repair… sounds like fun right… not so much… thank goodness the dresser is well made, has a wonderful shape and all the handles are present and accounted for! 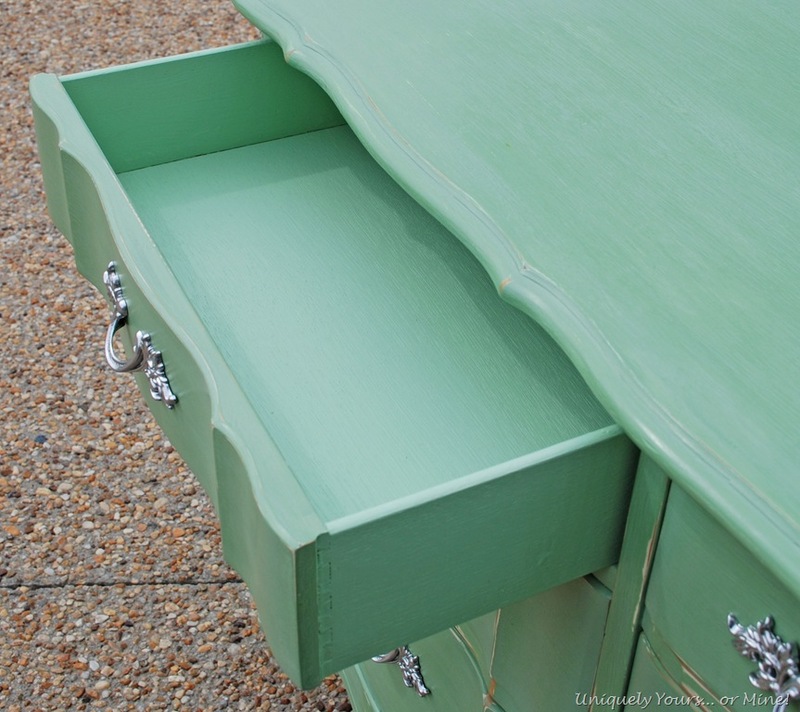 I first removed all of the hardware, sanded down the uneven paint finish and repaired the drawers that needed to be repaired. I painted the top with a coat of Kilz to even up the finish and remove the possibility of any of the remaining stains bleeding through the final finish. My client had a VERY specific color in mind so I worked up a few samples for her to choose from and luckily she found one she liked! 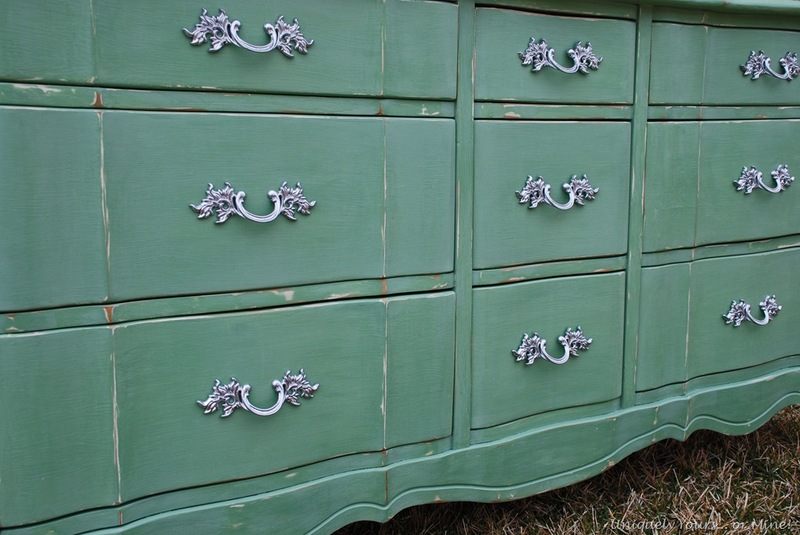 It is an equal parts mix of Annie Sloan Chalk Paint Pure White & Greek Blue and CeCe Caldwell’s Spring Hill Green… so YUMMY! I am in LOVE with this beautiful shade of blue-green… I think it could make both a blue and green lover happy! Just the right amount of distressing and a nice top coat of Annie Sloan clear wax. Also, because some of the drawers were pretty gross I cleaned them, sanded them where necessary and primed them with a coat of Kilz. I then painted the drawers with a can of “oops” paint from Lowe’s, it just happened to coordinate perfectly with the chalk paint! I sprayed the handles with Rustoleum’s Chrome spray paint… How great do they look now!? I seriously hope you liked this makeover as much as I do… I think this is going to be my new favorite color! Thank you for all of the great comments week after week, I love hearing from you! love, love, love it! thx so much for all the info, you sure do great work! the color is amazing! Thanks Karen! I adore the color, I may have to paint a few more pieces that color too! Absolutely beautiful – love the color!!! Thanks Suzan! I love your bedroom makeover! i am in looooove! 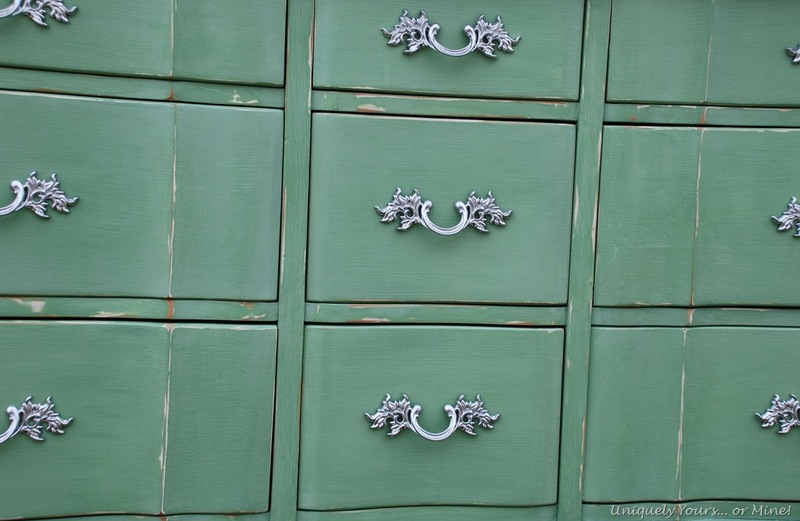 i am dying to find the right piece to paint a fun green right now! i am itching for spring, i guess! I know what you mean Cassie! The warm dry weather sure makes painting in the garage sooo much easier! So pretty, love the green! Visiting from FNF! Thanks Cindy! I just love the final results too! It is never too early to start filling a young mind with the appreciatioin of beautiful things. My 2 1/2 year old niece often comes to play and to stay at our house. We have quite a few antiques and vintage French pieces. I also have a sizable collection of porcelain dogs many of which are Staffordshire. While I don’t let her play with my most expensive pieces, the rest she has free rein. We taught her to be “gentle” about a year ago. It is amazing how careful she is. She also loves to get out my design books and design magazines. Like the rest of us, some pictures she likes (and goes back to again and again) and others not. Can’t wait to help when she is ready to decorate her own room. However, maybe by then, she won’t need any help! BTW – I, too, love that blue-green color. Thank you such much for your kind words Charlotte! You are totally right about never being too young to start appreciating nice things! Beautiful new dresser for a lucky little girl. I am re-doing my daughter’s room now and just painted her furniture that was my grandmother’s. 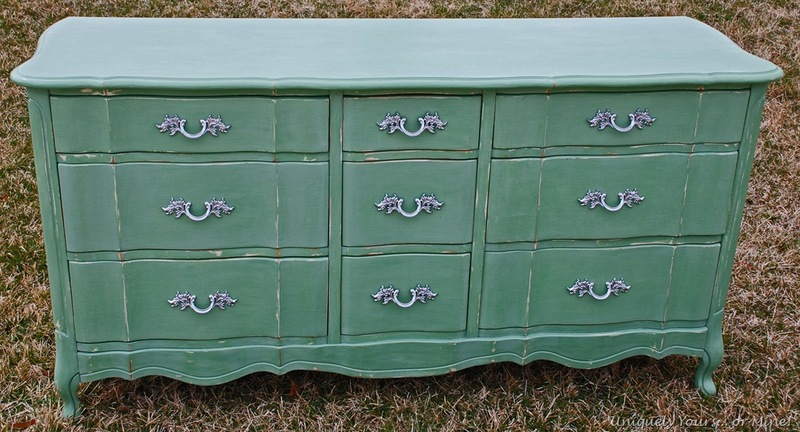 It is amazing how fresh paint can give an old piece new life! 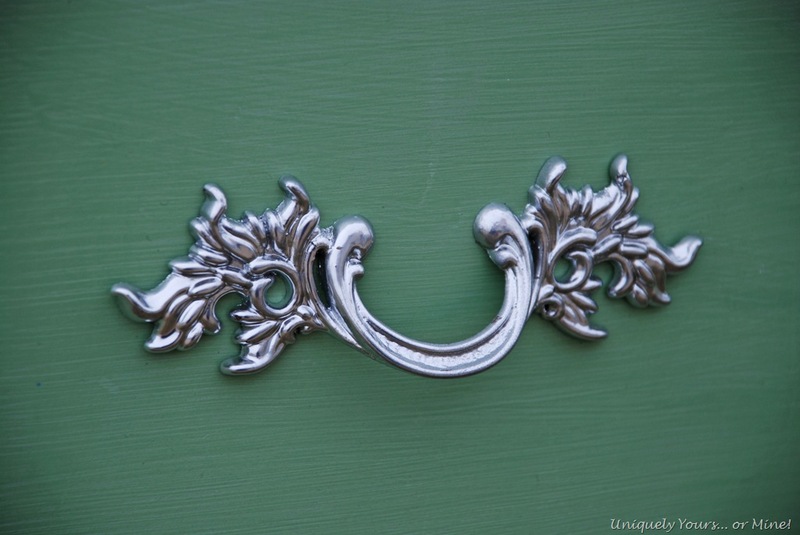 The hardware adds so much more gorgeousness to the dresser. Love the color you chose for it! Thanks so much! I think it dresses it up nicely too! 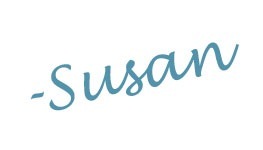 Beautiful job, Susan! 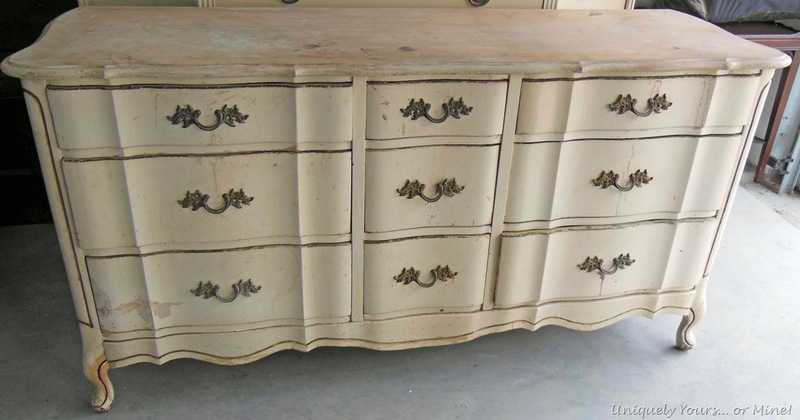 What a great dresser ~ I love the shape of these. Love the hardware and your tip for cleaning them up. They cleaned up nicely. Thanks so much! 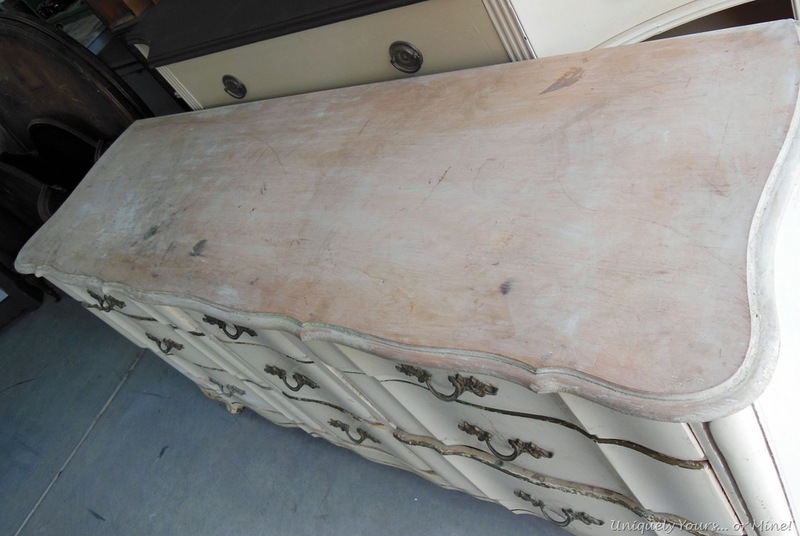 I can’t express to use truly how pretty this dresser is in person! Just a beautiful shade of green!